Bank Farm Leisure is a well-established Holiday Leisure business, located in the Gower. Bank Farm have been valuable customers of ours entrusting us with many various projects over the years. 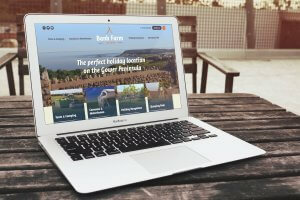 We have created websites with bespoke designs and functionality for Bank Farm as they needed something fresh, fun and modern to truly represent their company. After the success of the website build Bank Farm Leisure also recognised the potential their website could have, and this lead on to us helping their website and business to progress further in the digital world through digital marketing. We now take care of the monthly management of their Facebook and Google Ads along with design graphics for their website and social media. We love working with Bank Farm Leisure and will continue to help them progress in the digital world and reaching more customers with their paid advertisements and social media campaigns. Do you think you could benefit from our services? Maybe a website refresh? 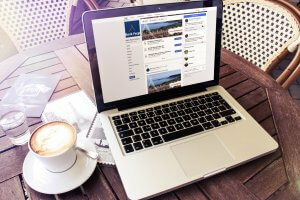 Or do you want to create a stronger digital presence? Our team can provide you with the guidance and tools you need to grow your business. Get in touch today on 01792 293 366. It all starts with a conversation! Copper Bay Creative are a great team and are very helpful when we need them. They helped us to re-design our website when we needed it to look more modern and bold. They've also helped us improve our websites SEO helping us get seen on Google. We are still in close contact with Copper Bay and enjoy liaising with them to keep our website updated and fresh. We definitely look forward to continuing our work with the team in the future. Copper Bay helped us not only create a website which we love but also an enquiry system. Since having this in place it is so much easier for our clients to contact us and make bookings through our online enquiry form. Copper Bay has also helped us reach more customers by managing our Google Ad campaigns and our Facebook page with targeted ads. Having just had our website completed, I would like to say a huge thank you to all at Copper Bay for their hard work and dedication they showed to get our site exactly as we wanted it. Their flexibility to quickly switch tactics when we changed our mind about something got us the site we wanted. They have a great connection with their customers, and their relentless perseverance to always make the customer happy made the whole build process a pleasure from start to finish, with helpful advice and tips. We would definitely recommend them to anyone wanting to have their website created or updated, and we certainly look forward to working with them again in the future.